If there’s one thing we love, it’s when the postman knocks with a little box from the guys at Abbey Whisky, it always has something exciting, but this time it comes with mystery. 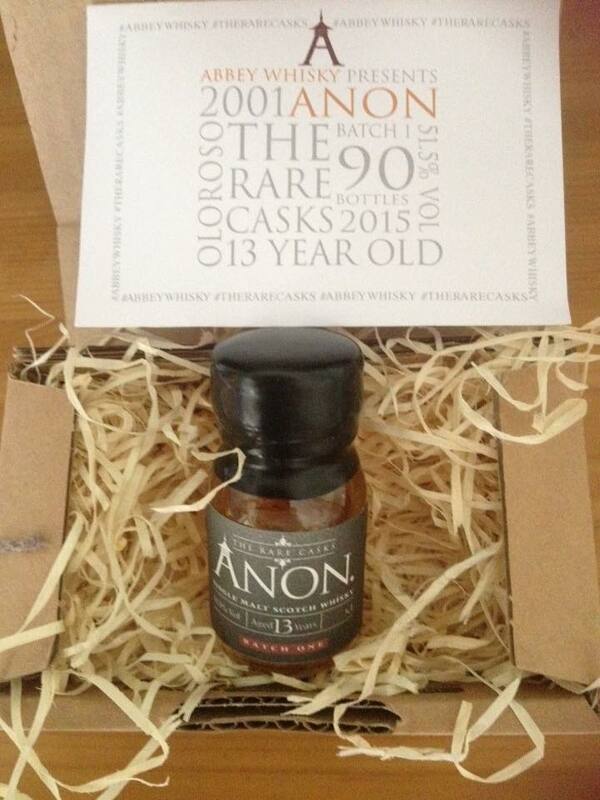 This latest release from The Rare Casks series is anonymous. We do have some clues though. Distilled in 2001 at one of Scotland’s finest distilleries, from the Highland Region, Anon. Batch 1 has been aged for 13 years in total, with the last 6 months of maturation spent in an Oloroso sherry cask. Bottled in 2015 at cask strength, only 90 bottles have been filled and made available for this new release in The Rare Casks series, this has been bottled at cask strength, 51.5% vol with 90 bottles filled. Buy it here for £54. First up is the alcohol prickle, fiery with just a touch of resin, before undertones of rich leather arm chairs and cigars. Sour cherries and bitter dark chocolate come through, bringing with it polished mahogany and just hint of damp earth. The sherry keeps on influencing bringing rich oranges, cloves, plums and plump, juicy sultanas. Given a little time, there is a touch of lemon, the richness becomes creamier, it’s still sticky sweet, with honey mixed with dried oats and boiled milk. Ripe, almost overripe, nectarines combine with comforting vanilla, mascarpone and soft pears and a hint of fabric softener, coaxing a gentle warm heather note, intermingled with barley fields and honeycomb. Sour and bitter, the dark chocolate from the nose with those sour cherries are first up on the palate, so much so it’s mouth watering! It’s all about the fruit just now, lemons and limes make this uplifting, those soft nectarines are elbowed out of the way by sharp pineapple, and sherbet, dried cranberries, and balsamic vinegar and fruity, fresh good quality olive oil. Whilst your palate is busy processing this, underneath there are glorious, chewy Oloroso notes, gingerbread spices, those sticky jammy red fruits and rich toffee sauce. All this is happening right at the same time, your palate just tosses you between the two very different, yet complementing flavours. There is the smallest touch of peat smoke in there too, almost overshadowed by the wide assortment of flavours, but it’s undoubtedly there if you go looking for it. Long, and peppery. The baking spices linger long after you’ve taken your last sip. For me the sherry really starts to dominate on the finish, with those baking spices and deeps fruits lingering, but then the honey and vanilla comes back through, and hand in hand with that is the heather. Still creamy but with added oakiness this finally starts to turn quite tannic but that just prolongs the finish. This is simply stunning, it’s also one of the most confusing, interchangeable whiskies I have ever tried. It’s undeniable well rounded, entirely balanced, but, and this is where things turn strange, it’s balanced by being unbalanced. Stay with me, I know this sounds strange but the moment this touches your tongue, your senses go into overdrive, the sharp fruits and sherbet effervescence slap you in the face, but almost as if you have split your brain in two, you pick up the Oloroso influence, so all the baking spices you expect, the jammy notes, and bitter dark chocolate. As the finish continues there’s a creaminess, with vanilla and plenty of honey. There’s a lovely hint of heather, before the gentlest whiff of smoke encircles your palate, with oakiness bringing out the tannins and taming the sharpness of the fruit. This is a stunning dram, and in my opinion fantastic value for money. I know it’s anonymous and you don’t technically know what you are buying (I think I could hazard a guess), but trust me, this does not detract from the fact that this is a fantastically complex whisky. Limited to only 90 bottles, something tells me this will be a huge hit, so if you want one, you had better be quick! Great job Abbey Whisky, you never disappoint, and for me this is just one in a long line of fantastic bottlings. Bitter chocolate to the max, followed by a dessert wine note. Dried leaves, some oranges and now some lemon. A good burst of citrus before the bitterness of the dark chocolate melts into a smooth, sweet, milk chocolate. The nose finish with warm dough and raisins. Quite warming to begin with and the bitterness is still there, along with more of the raisins and oranges. This gives way to a hot chili like taste. Liquorice whips, which is quite fitting as this dram has all sorts in it (bada boom). No sign of the lemon citrus from the nose, which is really disappointing. Hot, slightly spicy, quite a long finish, you can taste it for days. Although the nose and the palate are related slightly, they seem at odds with each other. The palate for me seems a bit flat and doesn’t offer me any great joy. I am unsure what it’s missing, but this is one of those drams that I didn’t get on with. Sometimes you get the dram and other times the dram gets you. This is one that got me. With thanks to the guys at Abbey Whisky @abbeywhisky for the official sample.